CHAPEL HILL (January 25, 2019) – Using summer school to graduate on time, retaining the best instructors, supporting community-college transfers and a $4.4 billion backlog in building repairs and renovations are top priorities for the UNC System with the 2019 General Assembly. In remarks to the board, Interim UNC System President William Roper noted that for the first time, the universities will partner with the NC Community College System on requests for some items. “And it’s intentionally a System-wide agenda. This is not a grab-bag of institutional priorities,” Roper said. • $10 million for summer school scholarshipsto help students graduate on time – or possibly ahead of time. The effort was successfully tested at UNC Asheville. 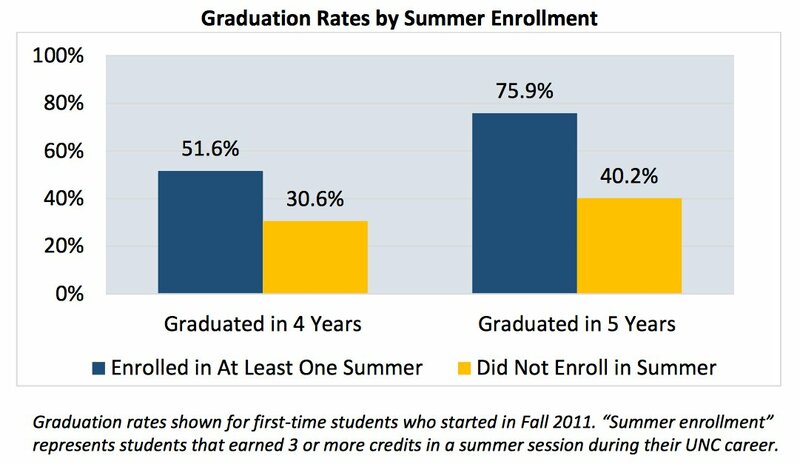 System officials say 51.6% of students who graduate in four years and 75.9% of students who graduate in five years earn at least three credits in summer school. Board member David Powers said the scholarships should be viewed as an “accelerant” for students to graduate on time – or possibly in 3 or 3-1/2 years. “One goal of this is to reduce the overall cost of college to families in North Carolina,” Powers said. • $10 million for Faculty Recruitment and Retention. As faculty salaries have languished, UNC campuses have been subject to targeted raids by other states and institutions. The Faculty Recruitment and Retention Fund allows universities to counter offers from other schools to high-demand instructors and recruit talented professors. • $4.6 million to strengthen transfers from community colleges, including $4 million for transfer student scholarships. Creation of more “on-ramps” to higher education is an emphasis of the System’s strategic plan. This initiative would include $150,000 to improve efforts to give military-affiliated students transfer credits for their parts of their military service. • $5 million for data modernization, part of an ongoing effort to provide university officials with timely, consistent financial data. • $4.4 billionin unmet repair and renovation (R&R) needs. CFO Clinton Carter said the System will likely request $75-100 million from the legislature. “The short answer is we hope to get as much as we can,” he said. University officials hope to convince legislators to let universities increase the percentage of their budgets they can carry forward from one budget year to the next – as businesses do – from 2.5% to 7.5%. Carter said that would yield another $116 million that could be used for building maintenance. “R&R has been a constant thorn in everybody’s side for a long time,” said board member Bob Rucho. “The more flexibility we can get the CEOs to run their campuses, the better off we’re going to be,” said Chair Harry Smith. • An additional $7.5 million for continued growth in NC Promise, which offers in-state tuition of $500 a semester at three institutions. Elizabeth City State University saw enrollment increase by 21%, UNC Pembroke by 11% and Western Carolina by 7.4% this year as a result, and they expect enrollment to continue growing. “This is a very important program that’s been very successful so far,” Roper said. But he added that NC Senate President Pro Tem Phil Berger wants to see NC Promise studied further before it expands to more campuses. • $2 million to continue NC State University participationin an effort to develop new manufacturing processes for biopharmaceuticals. • $1.4 million for staff and equipment at the NC School of Science and Mathematics’new campus in Morganton. • $1 million to support increased doctoral research at NC A&T State University. • $1.4 million to expand rural residencies from East Carolina’s Brody School of Medicinein Duplin, Halifax and Hertford counties. • Expansion of the NC Teaching Fellowsprogram of forgivable loans for students who agree to teach in STEM or special education fields from five partner institutions to eight. • $1.1 million to expand UNC Pembroke Health Sciences. These proposals are forwarded thinking and aggressive, and we hope legislators will support them. What about funding to address salary compression?